This AidCamp was held in conjunction with our partner organisation SERVE in Sri Lanka. SERVE works primarily in the areas of social work and education for the benefit of underprivileged and deprived urban and suburban children. The purpose of this project was to build a resource centre to provide a child friendly environment for the children of the shanty town community in Uswatte, giving them facilities for additional studies, to do their homework, use the library, and play indoor games such as chess and carrom. In addition to working on the building the volunteers were also taken to see SERVE's work for the rural poor in the area, as well as on several local and regional sightseeing trips. "I have never been good at practical tasks but if you feel the same don't let it put you off. 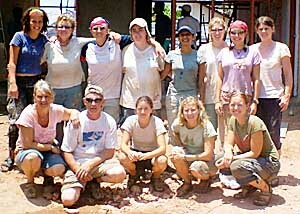 We were soon all painting, plastering, sieving sand and shifting bricks! However, not before a relaxing weekend in Negombo where we were able to relax on the beach and play in the sea! It was amazing how quickly everyone in the group became friends. After just a few short days we spoke to each other like we'd known each other for a lifetime. Some of these friendships I have no doubt will last a lifetime. There was an enormous sense of achievement in seeing the building go up brick by brick each day. The work was hard work but not too hard and the games we made up and the songs we sang whilst working made it seem more like a party than hard work! 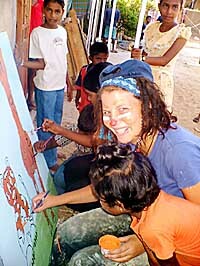 My favourite memories are of the children who each day gave us such a warm welcome and were so grateful for what we were doing, but who also managed to cover me completely from head to toe in paint! We were all choking back tears whilst the children sang during the opening ceremony of the building. AidCamps is not only a great practical way of helping people, it is also a great way of seeing the country. I fulfilled one of my lifelong ambitions of seeing an elephant in the wild when we went on safari in Uda Walawe national park. I'll never forget standing up in that stationary landrover while we were surrounded by a herd of elephants, one of whom could have been little more than two months old. So imagine my excitement the following weekend when we got to visit the elephant orphanage at Pinnewala! The trip was also a humbling experience. I was shocked and speechless at the devastation caused by the tsunami in Mount Lavinia, where we stayed for our final weekend. I met families living in shanty towns who had lost everything to the tsunami but who, despite having nothing, urged us to come in to their rebuilt home for a cup of ginger tea! I could not recommend the AidCamps experience highly enough. I think I went through every emotion possible on that trip, saw a beautiful country and met some beautiful people. In fact I enjoyed the experience so much I am going to apply for the Nepal AidCamp in September 2006!" "My face is hurting from non-stop smiling for three weeks!" "I cannot put into words what an amazing experience the AidCamp was. The kindness and smiles of the Sri Lankans will remain in my memory forever." "What an amazing, worthwhile, enjoyable experience!" "Overall experience has been fantastic and everyone I've met have proved to be friends I hadn't met until now." "Fantastic to work at grass roots level with children who really need it and also appreciate all that you do for them." "The kids make the experience worthwhile." "Unbelievable how much we have achieved in what seems so little time. It's an amazing feeling to see the finished building and the children's faces." "The feeling you get when you stand in front of the building you helped build for the children is beyond words. You should have to experience it yourself." "Fantastic, inspiring, and very rewarding 3 weeks. Would recommend anyone (and everyone) do an AidCamp!" "Great experience, fantastic fun, radical result." "Thank you for a great experience, loved every minute." "I liked the work very much, especially the teamwork together with the local people and for the tsunami children." "To see and experience everything I have with such an amazing project is definitely something I will never forget." "My face is hurting from non-stop smiling for three weeks!" "I cannot put into words what an amazing experience the AidCamp was. The kindness and smiles of the Sri Lankans will remain in my memory forever." "What an amazing, worthwhile, enjoyable experience!" "Overall experience has been fantastic and everyone I've met have proved to be friends I hadn't met until now." "Fantastic to work at grass roots level with children who really need it and also appreciate all that you do for them." "The kids make the experience worthwhile." "Unbelievable how much we have achieved in what seems so little time. 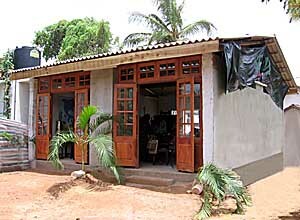 It's an amazing feeling to see the finished building and the children's faces." "The feeling you get when you stand in front of the building you helped build for the children is beyond words. You should have to experience it yourself." "Fantastic, inspiring, and very rewarding 3 weeks. Would recommend anyone (and everyone) do an AidCamp!" "Great experience, fantastic fun, radical result." "Thank you for a great experience, loved every minute." "I liked the work very much, especially the teamwork together with the local people and for the tsunami children." "To see and experience everything I have with such an amazing project is definitely something I will never forget."